Reach for a navy cardigan and a grey skirt for your kid to create a cool, stylish look. The footwear choice here is pretty easy: complement this outfit with yellow sandals. 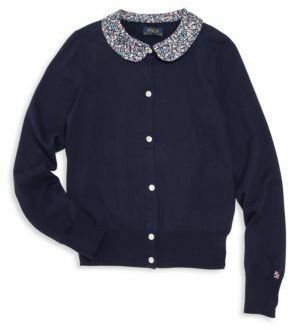 Suggest that your little angel choose a navy cardigan and light blue leggings for a laid-back yet fashion-forward outfit. This getup is complemented brilliantly with navy sneakers. Suggest that your mini fashionista dress in a navy cardigan and a pink skirt to create a cool, stylish look. As far as footwear is concerned, suggest that your darling opt for a pair of black boots. 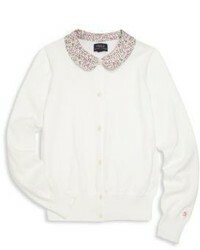 People will dote all over your daughter if she wears this combo of a Ralph Lauren girls pima cotton cardigan from Saks Fifth Avenue and pink floral dress. This look is complemented perfectly with tobacco boots.